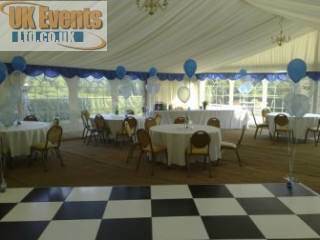 UK Dance Floor Hire Marquee. Marquee dance floors for hire. Hire one of our beautiful dance floors for your next marquee party. 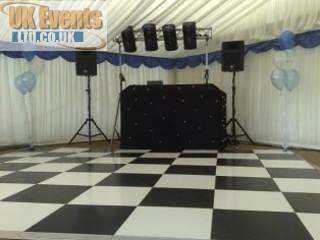 Our most popular dance floor for hire in a marquee is the lovely Oak parquet dance floor. It's rich deep oak colours and shine compliment any style of marquee. This floor is our cheapest available for hire. 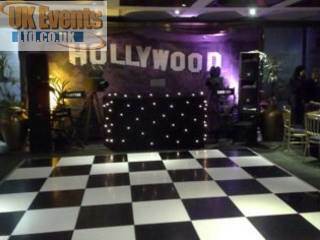 Moving on to our more specialist dance floors, we have pure white and jet black floors for hire. These are a must for corporate events and weddings. If you have the budget, stand out from the rest with a starlit pea light dance floor. Available in black or white, you'll impress your party with this floor. The floor requires a single 13amp power supply. Why not mix and match the starlit dance floor to create a stunning one off effect? Our lLED illuminated dance floors are at the top end of our service Hire. The LED dance floors are a must for a disco fever night or just a wild party you wish to organise. Make your party that little extra special with our Illuminated dance floor. We are now proud to offer LED uplighters for use in marquees. These uplighters are low power and can transform the look of the marquee. Uplighters add colours to the marquee walls to add depth and class to the marquee interior. Now available to hire is a hot pink dance floor with white sparklly twinkling LED lights.